This latest update (version 3.0.99 updated 01-31-2018 ) for the Divi builder adds all the latest free layout packs from Elegant Thems directly into the Divi builder. Direct access to hundreds of unique Divi page layouts and templates has been needed for a while now and this update will mean a much faster work flow for Divi users. Not all of the free layouts from Elegant Themes have been added but there are currently 20 layout packs whith a new pack being released each and every week, with each layout pack usually containing 8 or 9 individual pages. These layout packs will still be added to the Divi Theme Examples layouts library and into the Divi Layouts directory along with all the other free and premium Divi layouts available from around the community for an easy overview of what’s available from all sources. As part of the layout pack work from Elegant Themes, they are also releasing the associated stock images and icons for free download. These can be used for any purpose including commercial so you don’t have to worry about any licenncing restrictions that can be daunting with “free” stock images. These free stock image packs are all listed on Divi Theme Examples for easy referrence. 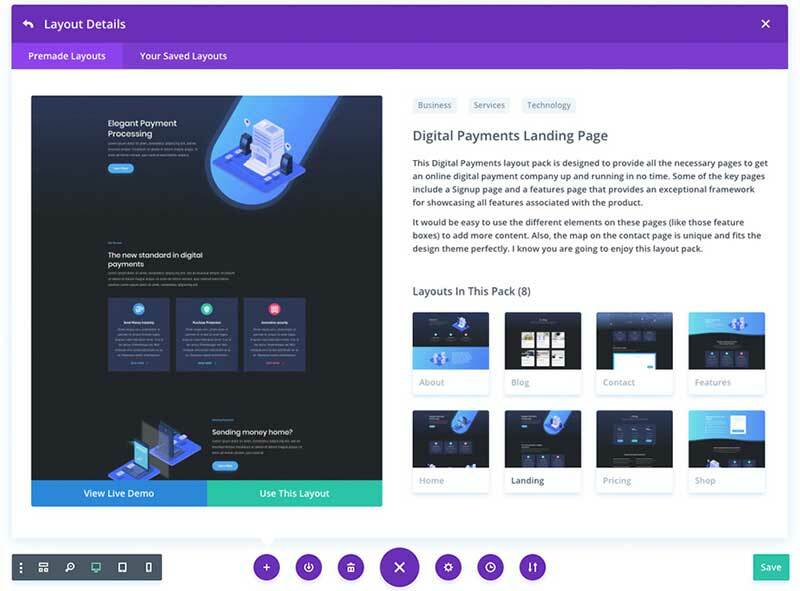 These Divi layout packs can now be browsed and searched from within the Divi builder. You can browse via category or search using keywords for a list of relevant layout packs. From the list you can then click on any pack to view the pages included within the layout pack. Once you have chosen a layout to use, it can be imported directly into the page at the click of a button. Watch the intro video for a rundown of whats new with the layout update or read the full layouts release post here.